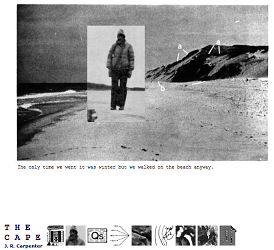 Cape Cod is a real place, but the events and characters of THE CAPE are fictional. The photographs have been retouched. The diagrams are not to scale. The use of maps, images, video, audio, geological and scientific data, and the structure of memoir all gesture towards verosimilitude, but the Carpenter’s statement above and the story itself undermine that tendency we have towards trusting that kind of information. Some questions to ask to better appreciate the deliciously deadpan humor in this piece are: Can we trust the speaker? Can we trust the artist’s statement above? Here’s a hint: we can’t even trust the navigational interface to give us access to all the sections of the text. Explore this space, its story, its voice, and its representation, and you may find that whether it’s real or not, it is full of truthiness.